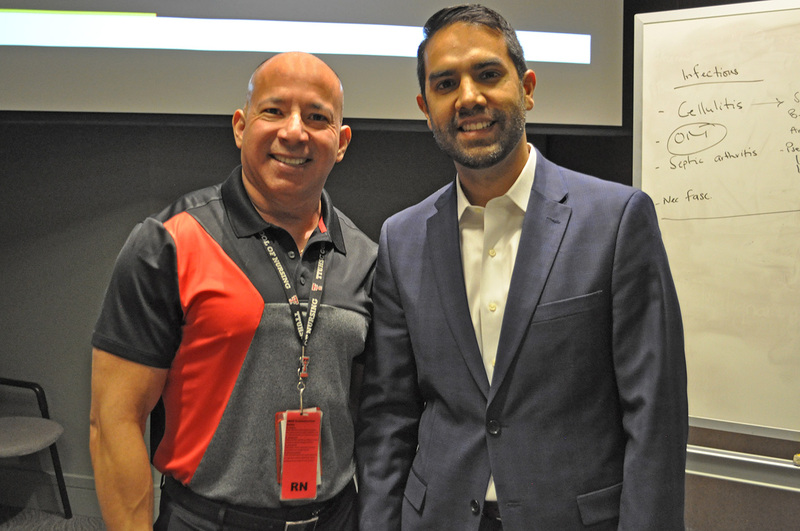 Last week, the Gayle Greve Hunt School of Nursing (GGHSON) gained a prestigious new lecturer: Nicholas Tejeda, CEO of The Hospital of Providence Transmountain Campus. 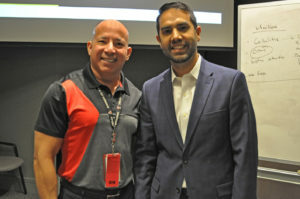 Manny Santa Cruz, D.N.P., M.B.A., R.N., assistant professor and assistant dean of the GGHSON, and Nico Tejeda, CEO of The Hospitals of Providence Transmountain Campus. Tejeda was invited to guest lecture for the nursing course Foundational Aspects of Professional Communication. The class of 60 students is typically led by Assistant Professor and Assistant Dean of the GGHSON Manny Santa Cruz, D.N.P., M.B.A., R.N. 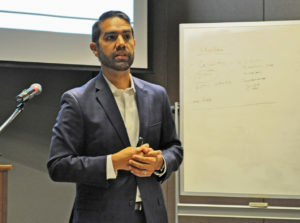 Tejeda’s lecture focused on health inequities — systemic and socially-produced differences in health status between different populations. These disparities are caused by various factors, including ethnicity, socioeconomic status, language, and mental health. Nico Tejeda, CEO of The Hospitals of Providence Transmountain Campus, was appointed as an adjunct assistant professor of the GGHSON in July 2016. “Ninety percent of patient care administered in hospitals is by nurses,” Tejeda explained. 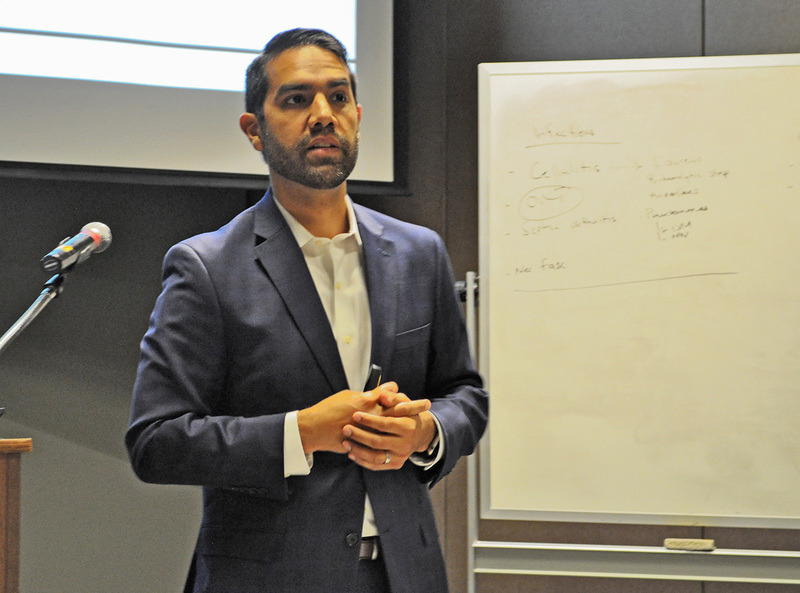 “That means nurses can play a major role in addressing patient inequalities and improving care.” In his engaging, anecdote-filled lecture, Tejeda charged the nurses-to-be to pursue greater cultural competency and embrace cultural humility. This was Tejeda’s first time leading a GGHSON class, but the CEO has plans to continue teaching in the future. Tejeda was appointed as an adjunct assistant professor of the GGHSON in July 2016. Tejeda holds a master’s degree in health services administration from the University of Kansas Medical Center in Kansas City, Kansas, and a bachelor’s degree in business management from Wichita State University in Wichita, Kansas. He is the immediate past-president of the National Forum for Latino Healthcare Executives, the outgoing chair of the American College of Healthcare Executives’ National Early Careerist Committee, and a member of the Board of Directors for the American Hospital Association’s Institute for Diversity in Health Management.